If your kids have grandparents or even great-grandparents alive today, how blessed they are! 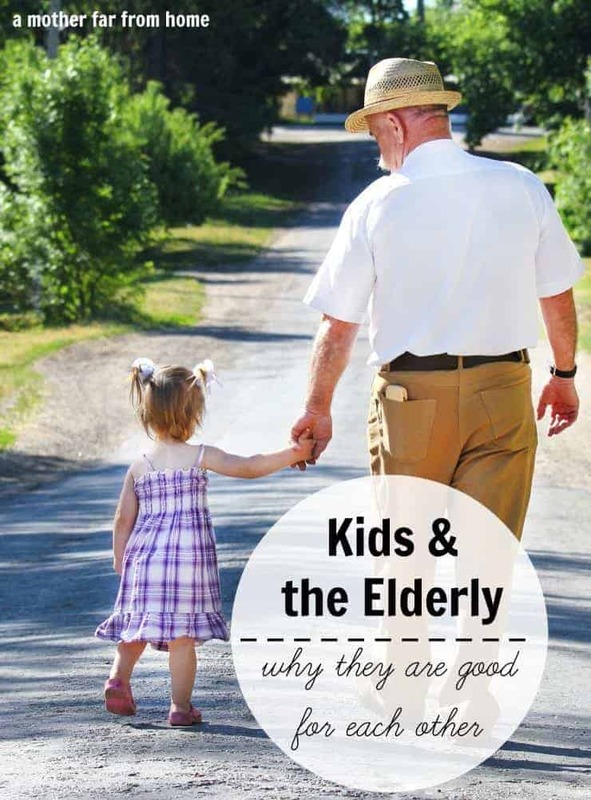 Here are some reasons why kids and the elderly are good for each other, and a gift basket for the elderly you can create with your kids! I was blessed to grow up near my grandparents, and I have a lot of great memories with them. From riding their golf cart to swimming in the pool to going out to dinner with them on Saturday nights. I enjoyed their company and didn’t see spending time with them as a chore, but rather as something I liked to do. Even if your kids don’t live near their elderly family members, there are still ways to help expose your children to the wisdom of the ages. Whether you encourage interaction at church, visit local members of the community, or do outreach at local nursing homes or retirement centers, the possibilities are endless. I remember being on a mission trip in high school and visiting various nursing homes doing skits, singing, and visiting. I loved it! If you are the type of person who can carry on a conversation with people of all ages without awkwardness, you’ll understand what a useful skill that is. I have friends of all ages, and (granted I am a talker…) can genuinely find points of contact and shared interest with those decades older than me. I believe this is directly tied to my relationship with my grandparents. Children who aren’t around the elderly often can be intimidated by people older than them, and this can put them at a disadvantage when finding a job and navigating life as they begin adulthood. Children bring innocence, joy, laughter, and youthfulness into any environment. Why do you think grandparents are so ready and willing to brag about their grand kids? Because the love of young children is rejuvenating! It makes you feel innocent and happy and, if only for a few moments, carefree. The elderly bring wisdom, experience, and maturity into an environment. Kids are growing up these days with warped views of what the world owes them. They think the world owes them everything when in fact, it owes them nothing. Older people can say things that would get ignored coming from the mouth of a mother or father. Some bits of advice that have stuck with me from childhood came directly from my grandparents. Grandparents and other elderly people have the special privilege of being able to spoil without having to worry about the day to day disciplining. This provides a special relationship both for the child and the elderly person. They can do special things, spoil them with sweets, and relate to them in a way that is mostly free from conflict and confrontation. People – even children – instinctively recognize people of wisdom and character. Letting your children spend time with godly old folks who can share their life experiences is a gift you and your children will forever be grateful for. My grandmother walked miles to school. And both her and my grandfather picked cotton by hand. In fact, my grandfather became a farmer and wouldn’t plant cotton for years (even after the invention of the cotton gin) because he was over it. My grandmother met him at a navy dance and told him if he didn’t ask her to marry him by the time she turned 26 she was “moving to Colorado.” My grandfather was the first person to plant soy beans in the state and his house has a medallion in cement by the power company as the first electric house in the whole county. My other grandfather was a doctor in the war where he met my grandmother, a nurse. He was asked to be the Surgeon General and even met with the President at the White House a time or two. He delivered most of the babies in our small town. He travelled to Europe on business. Later in life, when he had Alzheimer’s, he often thought we were at a restaurant in Paris. History is fascinating. Even to a child. Actually… particularly to children. What’s one way to start? One area of ministry in my church that is much appreciated and well done is the “visiting ministry.” We always look for a pastor who likes to visit, and people make an effort to drop in on those from the congregation who are aging or who haven’t been able to come out to church in a while. 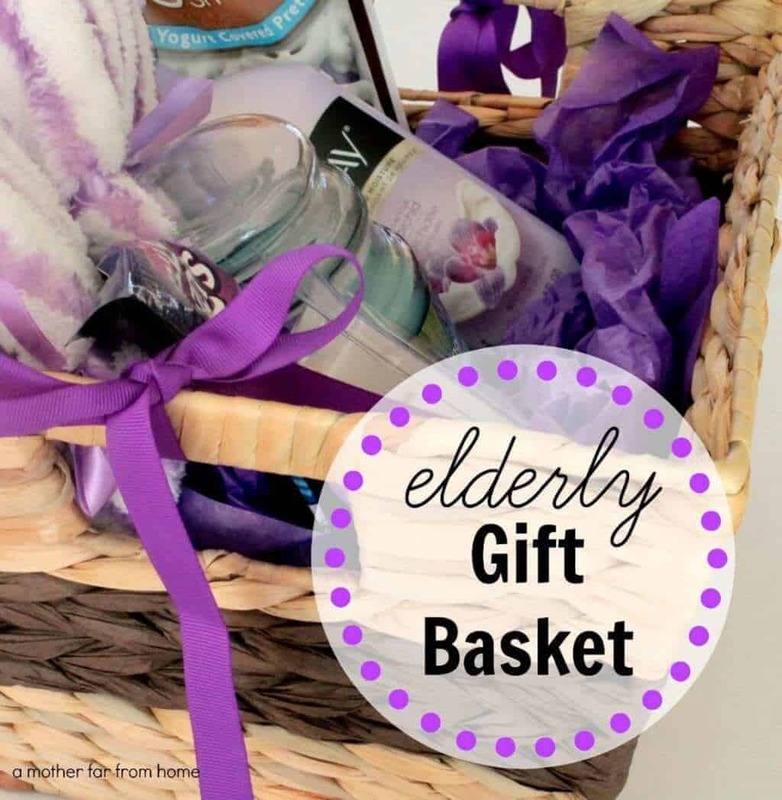 When Dollar General approached me to make a gift basket, I knew I wanted to make a winter gift basket for the elderly! Armed with a $30 gift card, I took my 3-year-old and 2-year-old to the store to buy a basket and stuff it full. I wanted it to nod to winter and a general theme, so we chose “comfort” and “purple” as our themes. The basket, all the goodies, and tissue paper were included in the $30! Oh, plus a Dora balloon and an Elmo balloon for my two shopping troopers. I wanted to stay within the total amount and chose thing of various sizes and function so it would truly feel special for the recipient. We had a good time putting it together. And by that I mean I tried to put it together and my 18-month-old tried to rip the tissue paper. Anyway, I know it will be good fun delivering it to an elderly person from our church. I have a sewing project for the kids on my list to do that’s way over my head, so we’re going to give the gift basket as a thanks to the lady who is going to help. PS – Thanks, Dollar General, for giving me the opportunity to talk about giving and appreciation. Be sure to check out their website! Shop online and save with Dollar General! « Has motherhood put a damper on your creativity? Lovely basket! My younger daughter has a very special and tender relationship with my dad, which is wonderful because both my grandfathers passed away before I was born, so looking at my daughter interact with her grandfather gives me a glimpse of the joy that I never had. Yes! My husband has the same experience, he wasn’t close to his grandparents! I think it is so special and am glad your daughters gets to have it! This is such a great point to make. One wonderful way to connect your children with elderly friends is to visit a local nursing home. The patients there are often lonely, and love the idea of someone new to share their stories with. I have very fond memories of friends I had in nursing homes as a child. And I LOVE the basket! What a wonderful idea.